Today it is International Day for the Remembrance of the Slave Trade and its Abolition. UNESCO (the United Nations Educational, Scientific, and Cultural Organization) first declared this day in 1998. The purpose of the day is, as the name says, to commemorate the tragedies of the slave trade. It also intends to break the silence around slavery and the slave trade. UNESCO runs several projects to commemorate the day. Additionally, the day highlights the importance of fighting against racism and all forms of oppression. In this post, I discuss the events commemorated on this day. I also discuss why it is important to break the silence around slave trade and slavery. Finally, I discuss some projects done by UNESCO to accomplish this. During the night of 22nd to 23rd of August 1791, an uprising started in Santo Domingo. This uprising would play an important role in the abolition of the transatlantic slave trade. Enslaved people in the western part of the island of Santo Domingo (nowadays known as Haiti) revolted against their owners. This marked the start of the Haitian revolution. In 1804, this revolution ended with the declaration of Haiti as a free republic. Although there was still a long way to go until the transatlantic slave trade was abolished, the event played a crucial role in the process. It was symbolic of a victory for human rights and freedom. In order to commemorate the uprising in Santo Domingo, UNESCO proclaimed the 23rd of August the International Day for the Remembrance of the Slave Trade and its Abolition in 1998. Since then, the day is used to remind people of the tragedy of the transatlantic slave trade. Moreover, it gives people an opportunity to reflect on the historic causes and consequences of slavery. Additionally, UNESCO highlights that slavery is not a thing of the past, but that it still takes place today. UNESCO is running several initiatives that relate to this day of remembrance. One of these initiatives is the Slave Route project. With the Slave Route project, UNESCO intends to break the silence on the slave trade and slavery around the world. According to UNESCO, breaking this silence can contribute to mutual understanding, reconciliation and cooperation among people. In this way, they want to improve people’s understanding of the causes, consequences, and forms of operation of slavery in the world. They also want to highlight the global changes that the history of slavery and slave trade has caused. Finally, they want to promote peace by encouraging reflection on cultural pluralism, intercultural dialogue, and the construction of new identities and citizenships. In addition to the Slave Route Project, UNESCO is running several other initiatives to accomplish the objectives just described. For example, a long-term project is ‘the General History of Africa’. This project was started in 1964. There were three main objectives to this project. The first objective was to reconstruct Africa’s history. The second objective was to free Africa’s history from racial prejudices ensuing from slave trade and colonization. The first phase of the project spanned over 35 years and over 230 experts contributed to it. After this period, UNESCO published the General History of Africa in eight volumes. After this publication, UNESCO launched the second phase of the project, called the ‘Pedagogical use of the General History of Africa’. 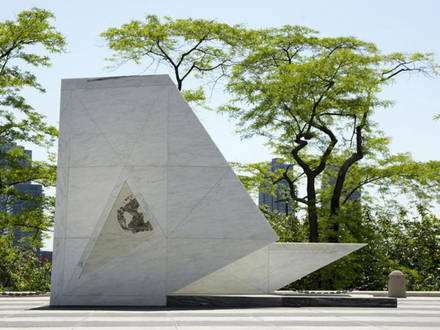 A third initiative is a permanent monument in New York called The Ark of Return, which was revealed in 2015. The memorial contains three elements. The first element is ‘acknowledge the tragedy’: a three-dimensional map of the world illustrating the transatlantic slave trade. The second element is ‘consider the legacy’, a full-scale human replica that illustrates the conditions under which millions of African people were transported during the slave trade. The third element is ‘lest we forget’, a triangular reflecting pool where visitors can honour the memory of the millions of people that lost their lives during the slave trade. Hopefully this post has given you some information about today and about some of the initiatives that UNESCO is running in relation to this day. If you want more information about what UNESCO is doing in relation to today click here. For more information about the Slave Route project click here and here. For more information about the General History of Africa project click here. Finally, 2015-2024 has been proclaimed the International Decade for People of African Descent. For more information about this click here. I am 23 years old and moved from Sweden to Greece for ten months. My main interests are human rights, activism, and art. I also love writing about LGBTQ+-related topics and social justice.